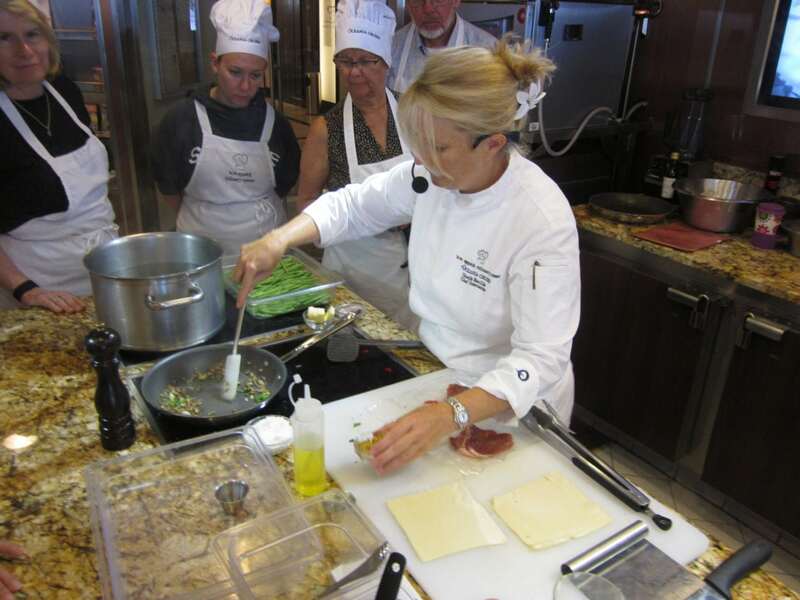 Have you ever taken a cooking class on-board a cruise ship? Me neither, but this trip we had so many “at sea days” I decided to take some classes. Each class was half day (morning or afternoon) and my goodness did we leave the class full! 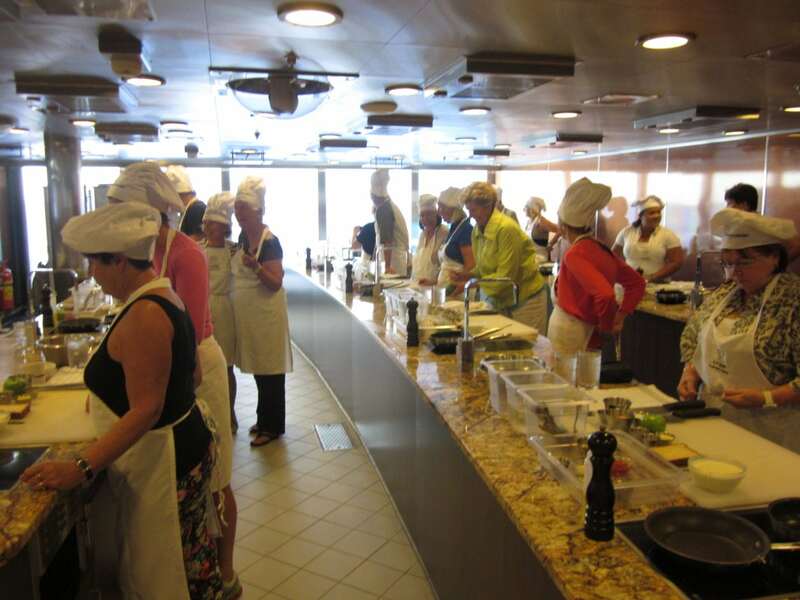 On both the Oceania Riviera and Marina ships they have a dedicated Bon Appetit Culinary Center. 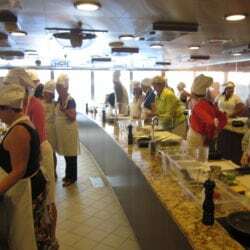 Both ships have a professional Chef, two assistants, 20 state-of-the-art work stations (where two guests work together), and you leave the class with notes and recipes. It is a fantastic way to spend a few hours, and the cost was $79 per class.I was on the Marina Ship with Chef Noelle Barille who was such a kick. She is from the Chicago area and every so often her accent would slip out. I have pictures, tips and tricks and highlights from each of the classes, and would like to share them with you. So you tell me by commenting below—what would you like to hear about first and I will post the most popular ones first. Don’t be shy now… tell me what you want to see and hear about! Thanks for sharing in the Comments Section below and I think you will enjoy this very much. 1. Oceania Favorites from Toscana Restaurant (Italian) Inspired by the Toscana Restaurant we learned the secrets of making pasta and short cuts for antipasti, entrees and desserts. Highlights included: Eggplant Involtini Alla Parmigiana, Risotto Ai Funghi Di Porcini, Fresh Pasta and Tiramisu. 2. Oceania Favorites from Jaques Restaurant (French) Making French cooking more than approachable, this class was a pleasure. Highlights included: Leek Quiche with Mixed Greens & Tarragon Vinaigrette, French Onion Soup, Rotisserie Chicken, Stuffed Lamb with Pistachio Duxelle In Puff Pastry, Sweet Potato Gratin and Lavender Creme Brulee. 3. Simple and Elegant Dinner Parties Many of the recipes for this class originated from Pepin’s Fast Food My Way series. Plating techniques were also shared. Highlights included: Salad of mushrooms, beets and goat cheese with Truffle Vinaigrette, Stuffed Kalamata Figs, Stuffed WOntons, Cookie, Berry & Limoncello Parfait, and Tarte Tatin. 4. Decadent Desserts Sampling desserts with fantastic wine pairings, we learned that fine desserts are approachable indeed. 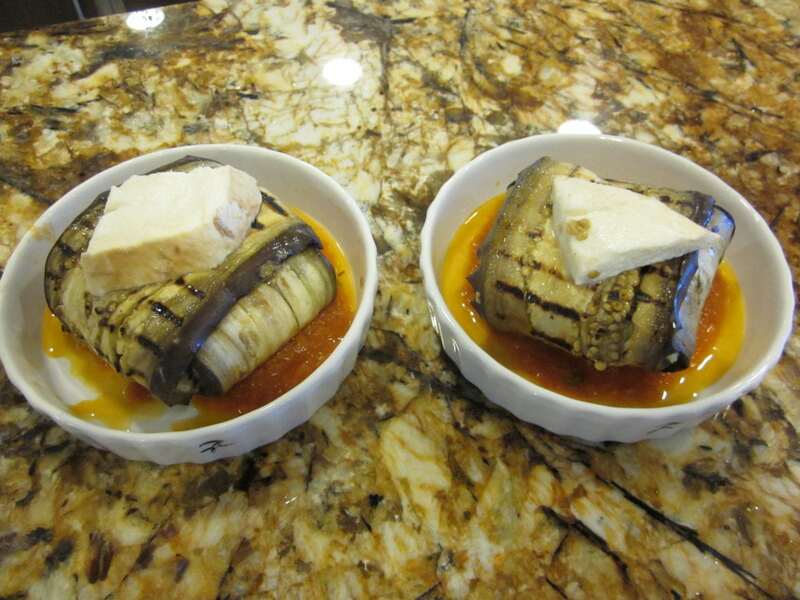 Highlights included: Banana Macadamia Pudding with Vanilla Sauce, Crepes Suzette, Dark Chocolate Mocha Truffles and Mexican Shortbreads. 5. 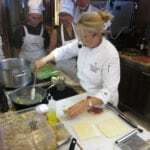 Southern Comforts Executive Chef Kelly (on the sister ship Riviera this trip) shares her coveted recipes from her southern upbringing. Highlights include: Mom’s Maryland Crab Cakes with Spicy Remoulade, Artichoke & Fava Bean Salad with Preserved Lemon, Grandma Kelly’s Mac N’ Cheese, Buttermilk Fried Chicken, Fresh Corn Hushpuppies, Brown Betty with Cardamom Chantilly Cream, and Low Country Lemonade. 6. Essential Jaques Pepin Drawing from his recent book Essential Pepin, this cooking class explored culinary techniques and recipes we can use at home comfortably. Highlights included: Basic Vinaigrette, Chicken with Fine Herbs, Poached Fish with Olives & Lemon andCrepes Suzette. 8. Thai-Asian Fusion The Southern Asian style of this cuisine has us checking our pantry for new ingredients, with an approachable list of recipes and techniques. Highlights included: Stir-fried Beef Garlic, Ginger & Scallions,Shrimp Pad Thai, Singapore Vegetable Fritters with Chili Peanut Sauce, Thai Fried Bananas and No-bake Zesty Lime Creme Brulee. 9. For The Love of Lemons Lemons are versatile and celebrate the Amalfi Coast. Highlights included: Ten Day Limoncello, Quick Preserved Lemon, Lemon Risotto With Veges and Herbs, and Drunken Lemon Semolina Cakes. 10. Magical Morocco The perfect blend of comfort and taste, this cuisine was a fun one to navigate. Highlights included: Orange and Carrot Salad, Vegetable Couscous, and Chicken tagine with Dried Apricots and Walnuts. Don’t be shy now… tell me what you want to see and hear about! 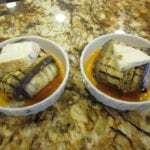 Note that in the Comment Section below….Thanks for sharing and I will get right to work on it!